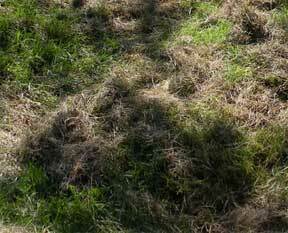 Thatch is simply dead vegetation like grass clipping that build up as a layer on the soil surface. A healthy soil usually contains a small thatch layer, excess can be detrimental, however, a healthy soil also will produce large populations of organisms which feed and consume the thatch. Kentucky bluegrass, Bermuda and Zoysia grass are especially prone to thatch problems. The accumulation of thatch happens faster on clay and compacted soils. Often times during the building process soils get compacted during the construction process. For homeowners that have a lawn growing on highly compacted or heavy clay soil the lawn many require annual or more frequent aeration and dethatching to reduce thatch buildup. The best way to control thatch is with lawn aerating where the plugs removed from the soil are distributed on top of the thatch. This speeds up the thatch decomposition and provides organic material back to build the soil.